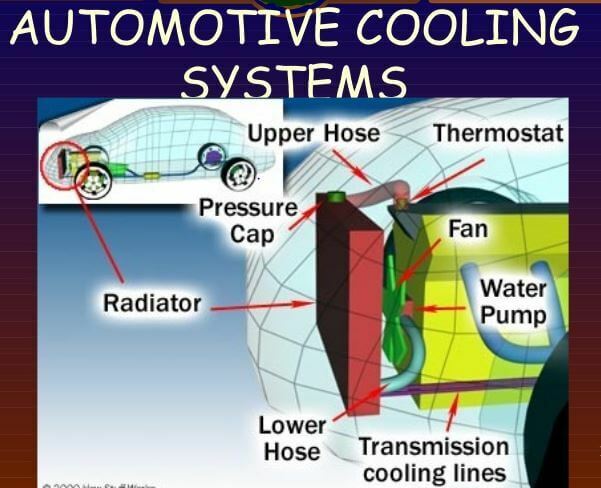 Water Cooling System Parts plays the major role in cooling of an engine. So, to cool internal combustion engine, air-cooling or water-cooling method is employed in automobile engineering. There are various cooling systems are available out there. But Impeller Thermo-siphon system has required following parts to perform the cooling action. The function of these parts is to cool down the hot water from the engine. Hence it consists of a large number of vertical tubes through which water flows down. The temperature of the water is reduced appreciably by drawing the air through spaces between the radiator tubes. This is done with the help of a fan, which is mounted on the impeller spindle. This Spindle is driven by a suitable pulley arrangement. 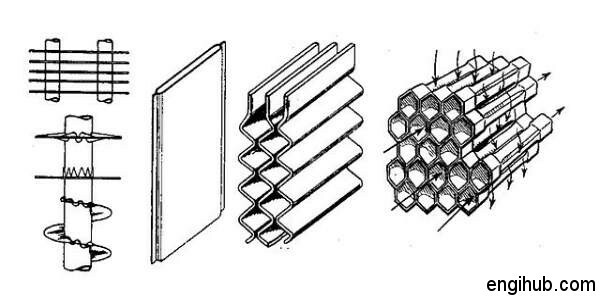 There are many types of radiator tubes are used in engineering but the most common are the tubular type. It consists of a large number of circular brass tubes pressed into a number of suitable punched parallel brass fins. The tubes are tinned to guard against corrosion and are staggered. The main disadvantage of this parts design is a greater inconvenience to repair any damaged tubes. Still, it is cheaper than the honeycomb type design due to its initial cost. The honeycomb radiator is used in racing cars. The water used for cooling must be soft because the deposits are given out by hard water. So, the deposits act as an insulator of heat between the cylinder walls and the radiator water. 0.03 kilogram of sodium bichromate should be added for every 13 kilograms of water to make soft water. The maximum temperature, which can be allowed in a radiator, is 3-degree centigrade below the boiling point of water. The ratio of the observed temperature difference to the greatest permissible temperature difference in a radiator is called suitability of the radiator. Some radiators are equipped with a heater which averts the danger of freezing of water. It also greatly reduces the time taken by the engine to reach its normal operating temperature. These parts increase the velocity of water through the system. The fan, which draws air through the radiator spaces, is usually mounted on the same spindle. As that of the impeller having widely spaced vanes to facilitate the flow of water through it in the case of failure. The bottom of the radiator parts is connected to the suction side of the pump. The power is transmitted to the pump spindle from a pulley mounted on the end of the camshaft or crankshaft. Thermostat parts fitted in such a manner that it prevents the flow of water below a certain temperature, from an engine to the radiator. The “Bellows Type” thermostat is generally used. The disc is connected to the bronze bellows through a link. The bellows are sealed against the atmosphere and contain alcohol inside it. On cooling, the bellows contract due to the condensation of alcohol vapor into liquid. The disc, therefore, closes the passage, which could be reopened only if a certain minimum temperature of the circulating water is reached which expands the below due to evaporation of the alcohol liquid inside. Generally, a thermostat does not allow the water to flow below 70-degree centigrade.